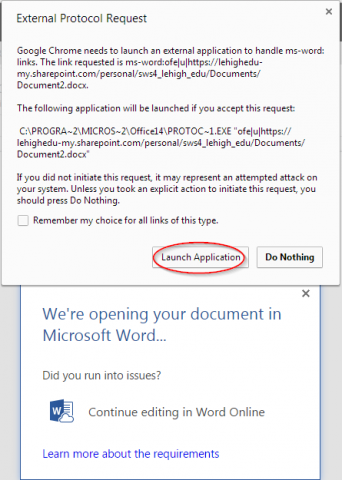 At times, you may find it necessary to open a document from your online Lehigh Office 365 account directly within your local desktop client of Microsoft Office. For this example, we will be using Word Online. If you are working within a newly created document, click the Open in Word (or Excel, etc depending on the file type you are working in) option in the menu bar at the top middle of your screen. If you are editing a previously created document from your library, select Edit Document from the top left menu, then choose Edit in Word (or Excel, etc depending on the file type you are working on). You may receive a message prompting you to allow the launch of the external program (this message will appear differently based on the browser you are using). Allow the application to launch or continue. You may see a warning message about opening potentially harmful files from the internet. If you are opening a file you created yourself, or if you are certain it is from a trusted source, click OK to proceed. You will be prompted to log into Office 365 one more time before being able to proceed. 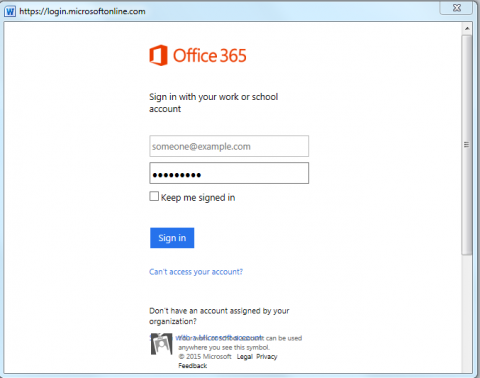 Log in using your regular Lehigh Office 365 credentials. At this point, your document will display in your installed version of Office on your computer. You will only be able to view the current document until you enable editing. Look for the yellow info bar at the top of your screen and click Enable Editing.